According to the National Census Bureau, grandparent-headed homes are among the fastest growing household types in the United States. Grandparent-headed homes are defined as living arrangements where the primary financial and caregiving responsibilities are held by one or more grandparents rather than a parent. Though the reasons that lead to this type of arrangement vary, many speculate that a difficult job market and bleak economy has led to an increase in the past few years. At the height of the financial crisis, the Wall Street Journal published an article describing the financial strain placed on grandparent-headed households. For grandparents who have already retired, finding a job at an advanced age can be next to impossible. The unemployment rates for this demographic are disproportionately high as are levels of ‘discouragement,’ or the part of the population so frustrated with trying to find work that they are driven from workforce. The degree of financial hardship is exacerbated by the increase in the price of everyday goods and necessities, like food and clothing. Beyond the financial strain, taking care of a young child can also have a significant impact on a grandparent’s mental and physical well-being. If an infant is placed in the grandparent’s care, he or she may have disrupted sleep due to nightly feedings. 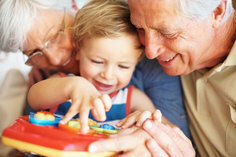 Grandparents raising young children are also frequently exposed to diseases and infections common in childhood. Depression and anxiety disorders are not uncommon and for children with developmental delays or behavioral problems, the demands placed on caregivers are that much greater. In some cases, grandparents may become the head of a household even when parents are present. In situations where a parent has become unemployed or otherwise cannot care for the children, he or she may move the entire family into his or her parents’ home. In addition to grandparent-headed homes, other types of arrangements where the parent is not the primary caregiver are on the rise. These may include instances where an aunt or uncle takes responsibility for a nephew or niece. Fortunately, many federal and state governments have started to recognize this trend and are putting resources in place to assist non-parent-headed homes. The American Association of Retired Persons has also created a comprehensive guide and resource center for grandparents parenting a child.